This issue, faced by managers all over the world, is being caused by an oversupply of data collection methodologies – the acceleration and convergence of technologies has brought the ability to capture and store more data than ever before. While it’s exciting to be part of the data revolution, the cost of not successfully leveraging that data has been estimated at 20%-25% of operating revenue for many businesses in the last year alone. Success in business and higher ROI is not achieved by the capture and storage of data alone. The successful companies of now and tomorrow will be those that can gain a competitive advantage through the speed in which they turn data into information, information into knowledge and knowledge into (the right) action. 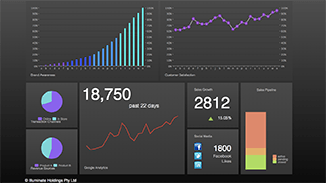 newfocus dashboards will help you convert data into smart ideas. Click on the images below for live demonstrations! Tomorrow’s leading companies understand that not everything that can be counted counts. For over 24 years, our key consultants have been providing Australia’s top companies with strategic management, marketing and customer service advice. We have helped organisations avoid the trap of measurement for measurement’s sake by helping to identify which data counts and converting it into smart strategies that build revenue and profits. 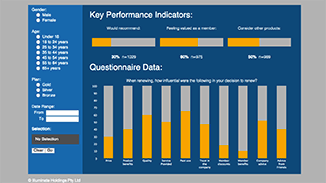 To sift the proverbial wheat from the chaff, newfocus’ integrated management dashboards are simple and easy to navigate and offer you the tools to make better decisions in real time. What makes newfocus dashboards different is that they are built by a collective of experienced managers, marketers, researchers, and programmers. Get in touch with us today and see how your business could benefit from implementing our online interactive management dashboard!